I have created sculptural artwork for the past 35 years and public artwork for the past nineteen years. Over eighteen works have been sited/commissioned by such entities as The Rhode Island School of Design; Socrates Sculpture Park in Long Island City, New York; Montgomery County, Maryland; The District of Columbia Arts and Humanities Commission; St. Petersburg, Florida Fine Art Museum; Arlington Art Center, Arlington, Virginia; The Cell, New York City; Honfleur Gallery in Anacostia DC; Embassy Suites Hotel, North Carolina and Colorado; International sculpture exhibitions in the Busan, Korea Biennale, and the Museum of Contemporary Art in Merida, Mexico, and most recently Vivace for the Watha T. Daniel Library and the Anacostia Gateway in Washington D.C. I have taught Neon Light Sculpture at the Smithsonian Resident Associate Studio Arts Program the past 24 years. Since 1983 the common thread of my work has been neon light. I use neon for its versatility: long-lasting industrial strength, vast possibilities of color, and for its willingness to be bent into almost any shape or form. It is the contradictory nature of light – tangible yet intangible, substantial yet insubstantial – that draws the viewer into the artwork. Light is, after all, how we see things. Light is in constant flux so it begs questions about perception and importance. 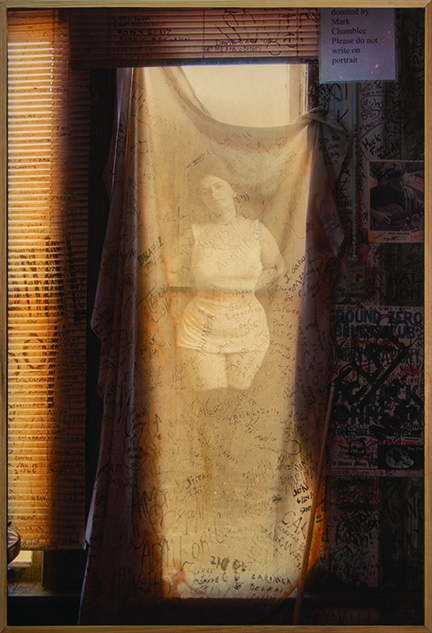 My most recent work, the Ground Zero Series is inspired by years of unrelated, overlapping graffiti on the walls of the Ground Zero Blues Club in Clarksdale, Mississippi. After transforming my own random scribbles into neon drawings in the series “Unintentional Drawings” I discovered a photograph in the NY times of the Ground Zero Blues Club. There were decades of intentional, overlapping marks entirely covering the club. I traveled to Clarksdale and collaborated with photographer Evy Mages, taking thousands of images of the club walls, ceilings and furnishings. Each mark is subject to an overlapping mark, until the messages become blurred and are transformed from their original intentions. Then someone makes an even bolder, broader mark, obscuring the history below. Finally, my light drawing becomes the last mark: highlighting, deconstructing and reinventing the images below.